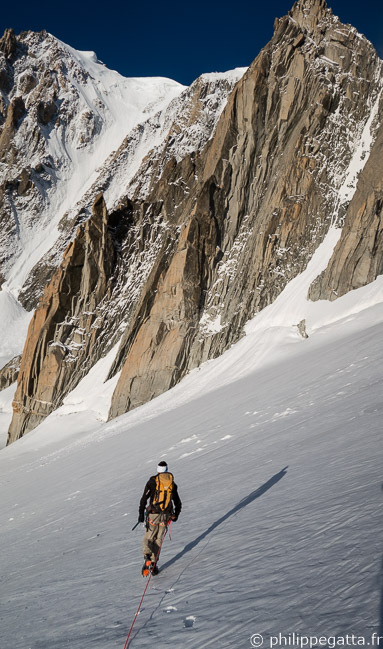 After the recent snow falls on Mont Blanc Massif, most routes were in winter conditions except the Pointes Lachenal. 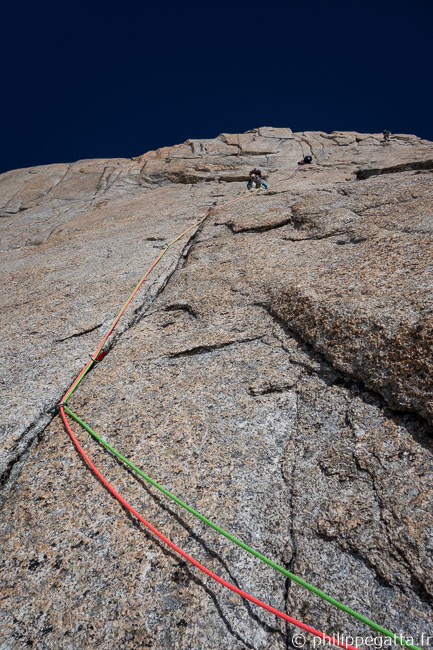 Pascal and I went back to climb another route there ; A l’oree du bois. There are some nice pitches but the route is a bit confusing as it crosses 3 other routes. 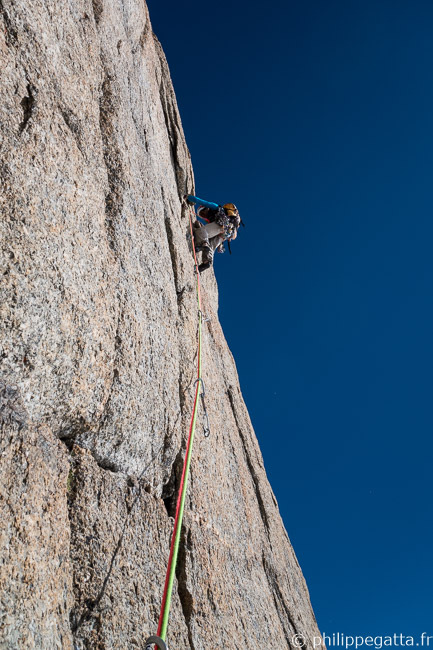 Anyway it was a nice day and a fun climb on the nice granite of Pointes Lachenal. We took the first cable car from Aiguille du Midi and reached the bottom of Pointes Lachenal in 30 minutes. The route is 250m high and graded TD+, 6b/A0. 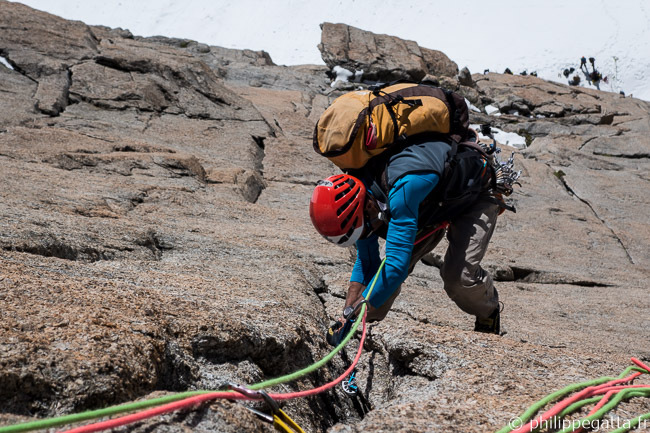 There are bolts on slabs and for the anchors, the cracks are relatively easy to protect. On the photo above, we can see the start of Le bon filon in the shade and the start of A l’oree du bois and Harold et Maud just 2 meters left. 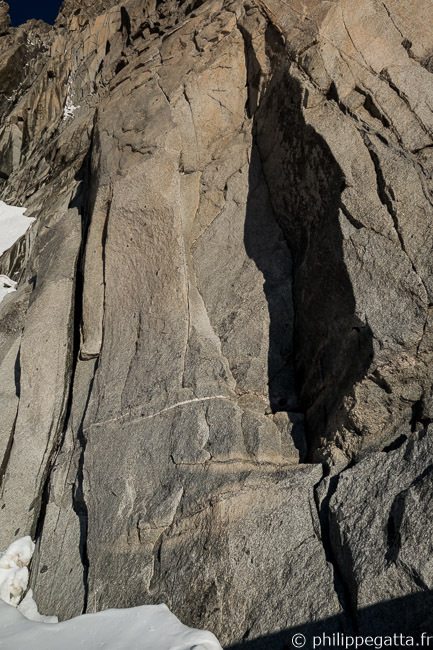 The first pitch is common with Harold et Maud, then we took left above the 1st anchor (2 spits). Grades: 6b, 6a, 6b, 6a, 6b/A0, 6b, 6a, 5, 4. 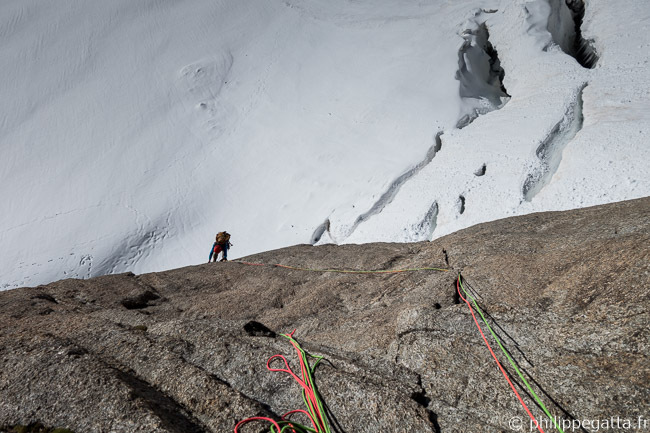 With a 60 meters rope, it is possible to link the 6th and 7th pitches which are common with Harold et Maud. We climbed the route in 4h (with the pack) and went back to Aiguille du Midi in 35 minutes. 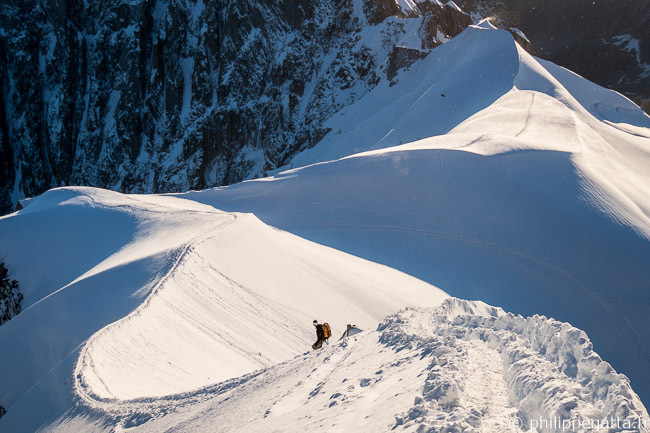 This entry was posted in Alpinism and tagged A l'oree du bois, Aiguille du Midi, Mont Blanc Massif, Pointes Lachenal. Bookmark the permalink. Both comments and trackbacks are currently closed.